Please have a look through the images. 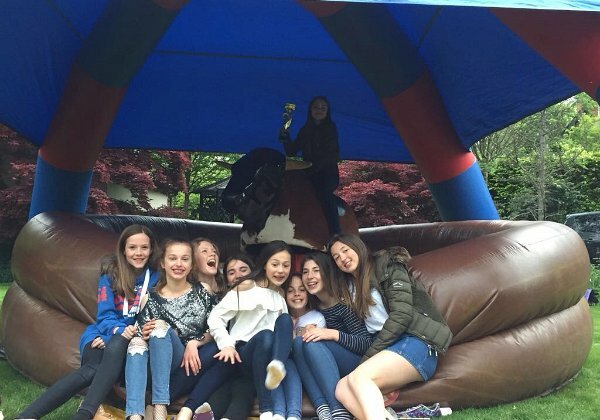 We have covered Bouncy Castle events in Manchester and Stockport for many years. Our Rodeo Bull Hire service has covered the whole North West including Liverpool, Warrington, Wigan, Leeds, Lancaster and many more areas. Safiya's Retreat spa in Bolton had a girly night with some fun from the Rodeo Bull team. 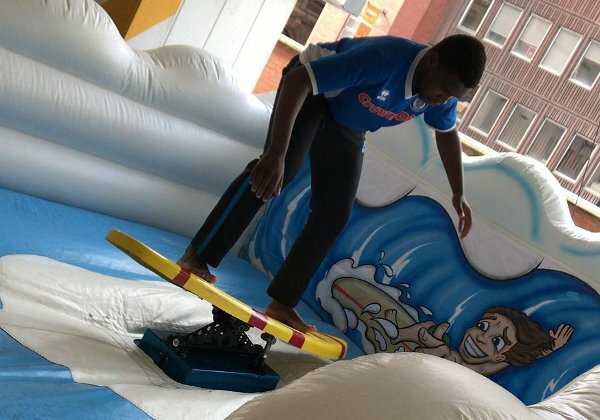 These staff in Manchester went to work for a normal day until there boss called Castle Empire for some Surf Simulator fun. 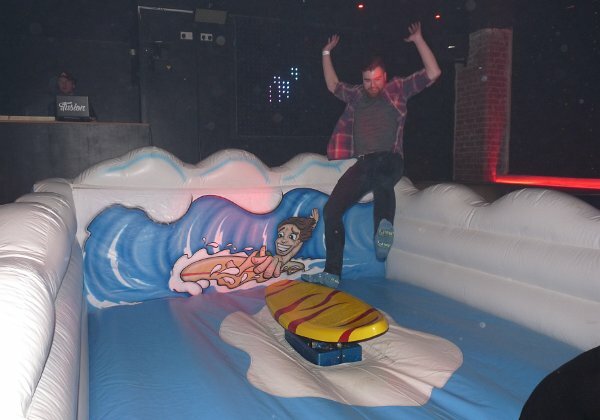 Surf Simulator for a bar in Macclesfield. This kept the visitors entertained until the early morning. 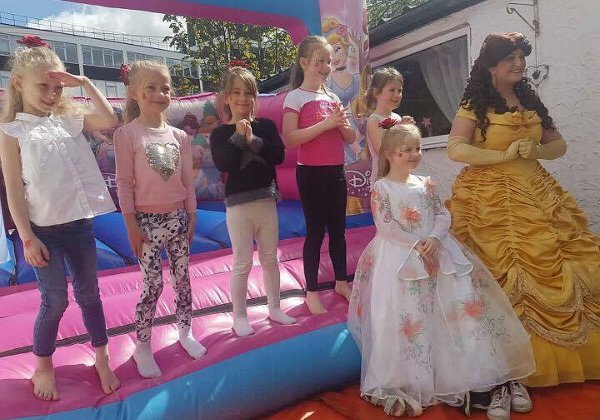 Allure Pamper Palace in Cheadle Cheshire hired the princess Bouncy Castle for a pampered day for these little girls. Hen Party in Altrincham with the Rodeo Bull. Manchester Night Club with the Rodeo Bull . Varsity. Urmston Grammar with the Rodeo Bull for the students. The Southern Hotel in Chorlton Manchester had the Rodeo Bull. The event was held indoor and lots of fun was provided. Birthday Party for the owner of the pub. We were able to keep guests entertained for the evening. Images taken at the Robin Hood Pub in Stretford Manchester. Rodeo bull for a childs Birthday. Festival in Swansea with the Moonwalker dome. Stockport Grammar end of school leavers. Gallery of Rodeo Bull parties in spring 2012 . Manchester University with the Rodeo Bull for the students. A collection of Rodeo Bull events. Mixed pary images for a various events. Radio Station Rock FM had the Rodeo Bull for an event (staff). Birthday party at Oldham Conservative club with the Rodeo Bull. What a fun filled night and congratulations to the best rider. Oldham Carnival with Harry Potter inflatable slide. The sunny day, lots of sweets and happy faces made a great event. Oldham Carnival 2010 with our inflatable slide and inflatable dome. A collection of Rodeo Bull Parties in autumn. A mixture of various venues all in one album. A collection of Rodeo Bull Parties in autumn. A mixture of various venues all in one album..
Wythenshawe Rodeo Bull event at a local home. Nathans Rodeo Bull Birthday party in Stockport. West Indian Centre Manchester enjoying a Bouncy Castle Slide for the local fun day. Primary School in Middleton, Manchester enjoying two Bouncy Castles. One for the Boys and one for the girls. A collection of Rodeo Bull parties in 2010 from various venues. A mixture of Birthdays and Corporate. A collection of Rodeo Bull parties from March 2010. Various locations indoor and outdoor. Manchester West Indian Sports and Social Club Mass festival. Bouncy Castle Moonwalker Dome and Inflatable slide for the community. Manchester University end of year party. Allen Halls Student Accomodation Rodeo Bull Party. Manchester Carnival 2010 with Harry Potter and Bouncy Castle Dome, Rodeo Bull and Adult Bouncy Castle. Attendance at Manchester Carnival with Scooby doo inflatable slide, Harry Potter Inflatable Slide and the Inflatable Dome. Leeds annual Mela with our Inflatable Slide. A fantastic cultural event celebrating was helped with our service . Bucking Bronco event images from June 2007 around the North West. A Day for the local Jewish community of Prestwich with our inflatable slides and Bouncy Castles. Jamaica Day in Manchester. A new carnival for the event calendar and Castle Empire Bouncy Castles were present to entertain the younger audience. Bouncy Castle supplied for the community of Gorton for the "I Love Gorton Day"
Annual Hazel Grovel carnival showcasing our inflatable slide and dome. Rodeo Bull for Global Logistics in Manchester who hired the Rodeo Bull. Gatley Carnival in 2011 for the community of Gatley. Bouncy Castle we the highlight of the entertainment for the day. Castleton Festival with the Moonwalker Dome and Bouncy Castle Slide. A Very happy day for this friendly community. Inflatable Dome in Moss Side Alexandra Park for a fun day for the community. Africa Oye 2011 with our inflatables in Liverpool. Africa Oye 2010 with our inflatables in Liverpool. African Arts festival in Liverpool with Harry Potter inflatable slide. Maximum fun was provided with this bouncy castle slide. Africa Oye 2008 with our inflatables in Liverpool. Africa Oye 2007 with our inflatables in Liverpool. 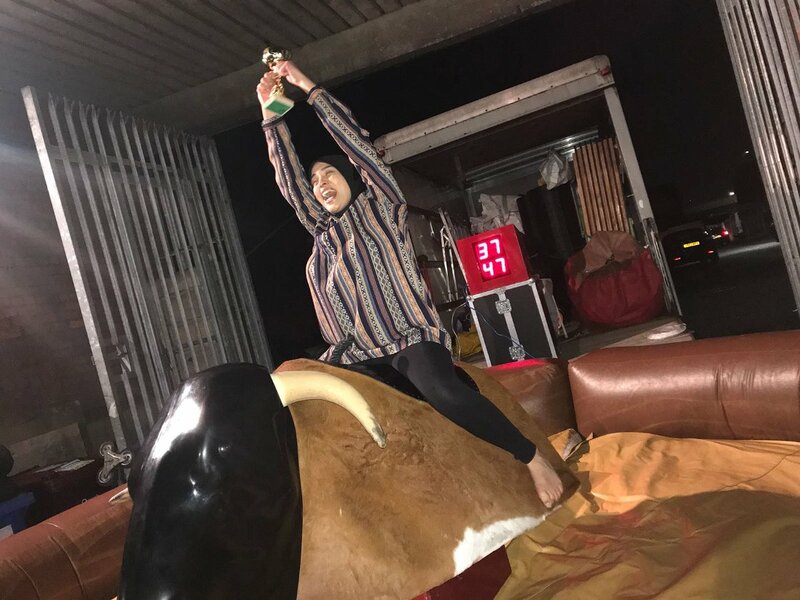 Pure Legal Ltd had a Rodeo Bull Ride-off so colleagues could battle against each other. Event took place in the Hilton Hotel Liverpool. A few snap shots from an event in Oldham and Macclesfield March 2017. A collection of Summer Rodeo Bull images from the past years. Golden wedding western party for a couple in Stockport. January 2017.